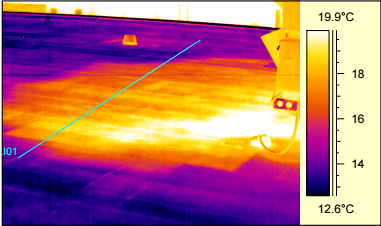 An infrared scan is one of the best and most accurate tools available for detecting “problem areas” with your commercial flat roof. Essentially, the scan will pinpoint areas of wet insulation down to the inch allowing you to take action on these areas before they expand and deteriorate more of the surrounding roof system. 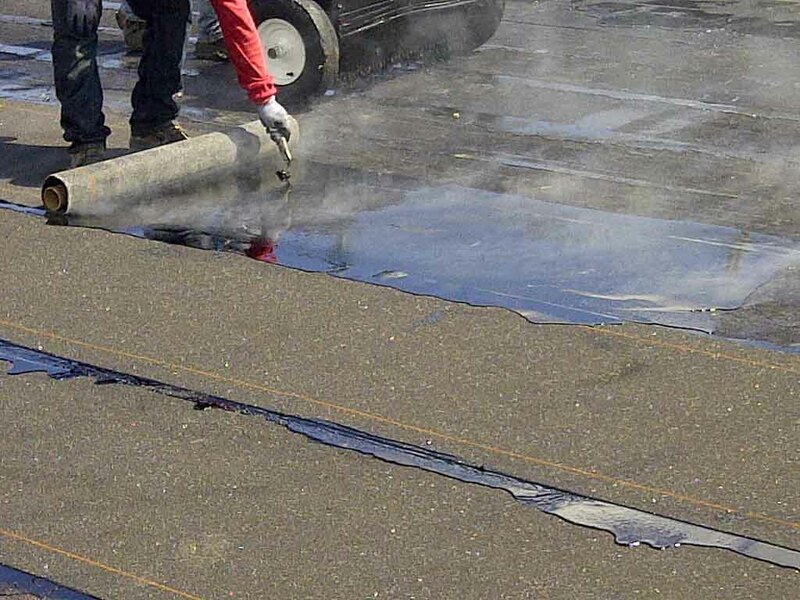 If you have been experiencing issues with your commercial flat roof, then potentially you may have areas of wet insulation. Regardless, if you have addressed the leak issue, once the insulation gets wet it typically will retain that moisture causing further damage to the surrounding roof and potentially the steel deck as well. The issue can really be compounded depending on the type of insulation that you have in your roof system. For example, PolyISO and fiberboard will retain moisture, whereas, fiberglass is prone to not withhold moisture. In older buildings that have had their roof installed back in the 70’s or 80’s would have been subject to phenolic insulation. This product has been discontinued, specifically, due to the insulation properties when mixed with water it would cause corrosion on a steel deck. If your roof has phenolic insulation, then it is highly recommended to conduct an infrared scan to get an accurate result of the overall condition, especially if you have experienced leaks in the past. As the flat roofs temperature will rise tremendously throughout the day, come sunset this heat will rapidly release from the roof system. Except for the problem areas that may be retaining moisture. If the roof is wet it will hold that heat for several hours into the evening. This allows infrared technicians using the proper equipment to scan the roof and detect heat irregularities. To verify, these areas are marked and moisture probe is performed to 100% determine if the insulation was actually wet, or if it was an anomaly like a build up of roof material in one area. Why do I need to scan my roof? There is no better tool to detect problem areas within your roof that requires attention. It will cover the entire surface and highlight any areas that are potentially wet. Once you have verified this information, it is now extremely easy to take action on these areas by cutting out the wet roof system down to the deck and replacing with new. This will eliminate future issues and from the wet insulation from spreading, and keep the roof performing for the long term. If you have isolated the areas of wet insulation and have the documentation to address, then you could also consider providing a roof restoration service to your existing roof system and keep it performing for many more years to come. A roof restoration will provide a minimum of 15 years life expectancy and cost a fraction of the price to replace your commercial roof. After the inspection has been completed you can expect to receive a detailed report on the findings. 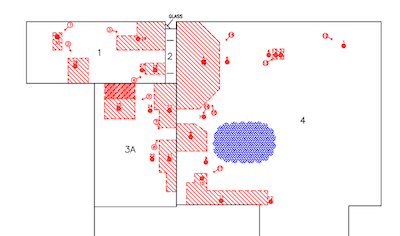 Moreover, this would include a CAD drawing of all suspect areas marked across your facility, along with the test results for the verifying moistures probe and core tests. Generally, the report will also include pictures of the suspect areas, and verification of the moisture probe as well. With this information at hand you can now take action as a well informed facility manager. Depending on your location the infrared scan may be optimal in the seasonal warmer months. For example in Toronto and surrounding areas, the optimal time to scan your roof would be between April and October. Typically, the results are more accurate as we have longer days and hotter temperatures throughout this period. 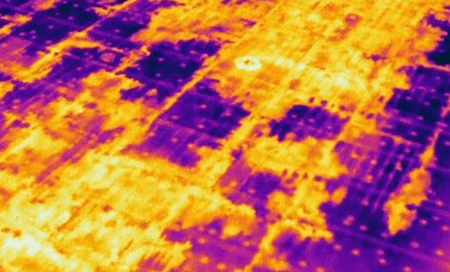 The infrared scan is one of the most effective tools for conducting roof repairs. The service can be conducted efficiently and provides detailed reports that facility managers can take action on immediately. 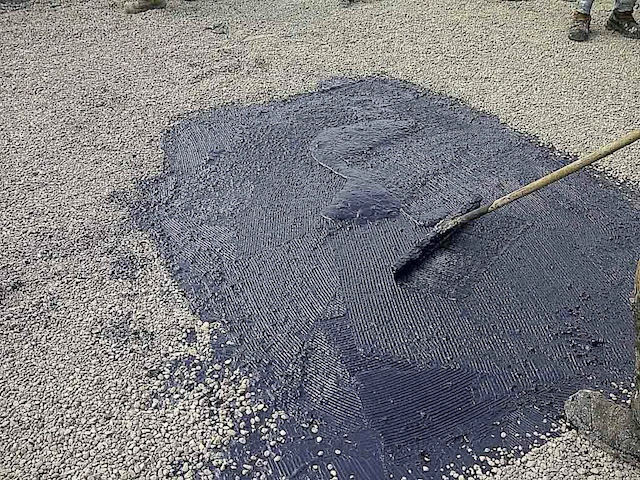 Stopping leaks may be the first priority for any building manager, however, determining areas of wet insulation is imperative if you want to keep your roof performing. If you would like to learn more about commercial roof restorations, please contact us.